You have probably noticed I love bracelets, especially bangle or wrap bracelets. I wear them most every day and have purchased them everywhere. I have big hands, like my Dad’s, and my wrist is 7 1/2 inches, so I have rarely purchased a bracelet at an accessory store or at a regular retail site. So what do I do? 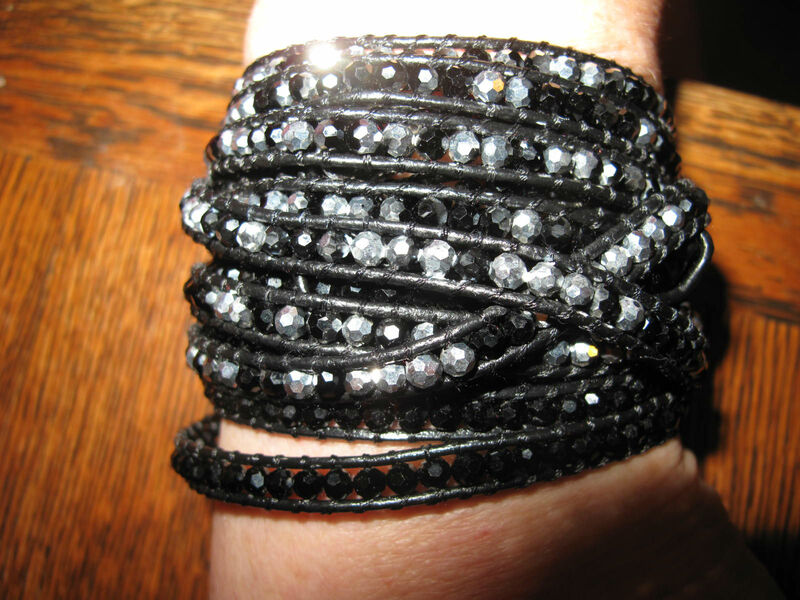 The bracelet above is two Victoria Emerson’s wrap bracelets that I connected together, and I love that they alternate black and crystals. The two of them go around my wrist about 8 times, rather that 10 times as they are expected to do, and I love wearing them. I have had them a couple of months, we will see how they hold up. You could certainly make something like this for even less than the sale price that I paid. HERE are some YouTube tutorials of varying difficulty. There are over 2,000 plus size bracelets on ETSY. 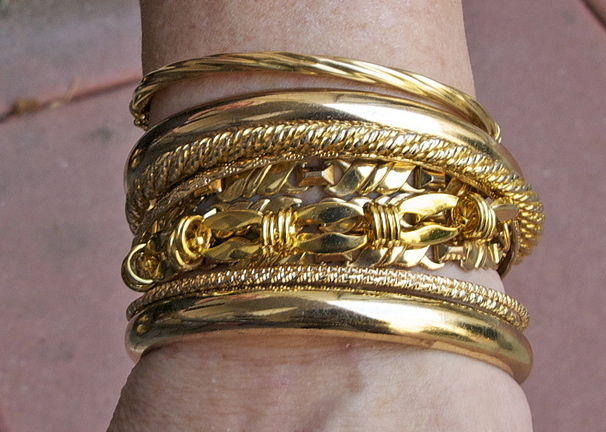 DIY Bracelets: For “gold days” I have taken my mother-in-law’s, as well as my own costume and fine necklaces and tiny bracelets and connected them together to use as a wrap bracelet. It makes me SO happy to be using jewelry that was sitting in my drawer and I love the look. Since I am retired and I can wear whatever I want, my standard everyday look has been rhinestone bangles for the last couple of years and I have been buying them at Torrid. But sometimes a rhinestone will fall out the first day, the bracelets have fallen apart after everyday use or occasionally one of them will not fit. But I do love them and I keep trying. When we went to Europe last year I wanted a memento so I bought this sweet stretch bracelet in Cannes, and it does not even turn my wrist black when I wear it. LOL. I occasionally buy a regular bracelet with stretch. I really wanted some vintage bakelite bracelets but all the bangles were WAY too small so I settled for a stretch version on EBAY. You can buy Plus Size Bracelets from these sites: ASOS Curve, Lane Bryant, Torrid, avenue, Sonsi, OneStopPlus, debshops, Domino Dollhouse. I would love to hear where you are buying plus size bracelets and how they are holding up for you.